I get a lot of ideas for things I want to do to the house. Big ideas my husband promptly shoots down because it’s scary to make changes to a house that’s only a year old. If it’s so new, why make changes? I went with Valspar Exterior Paint + Primer. To prep the doors I simply cleaned them to remove any dust or grime and taped off the windows, locks and knobs with painter’s tape. I was planning on using a small roller to paint the door but ended up doing the entire door with a small angled brush. Each door got two coats about an hour apart. I did learn one big lesson in the process-the front door had faux frost on the window and I thought I could tape right over it and, nope. Didn’t work. I got paint on the window film and ended up pulling it off and ruining it in the process of trying to get the paint and tape off. So, don’t do that if you have any kind of film on your windows! Other than that the process was fast and easy and I think it made a pretty big impact. I feel like it makes the white trim pop and gives a custom feel. So what do you think-do you like the difference? 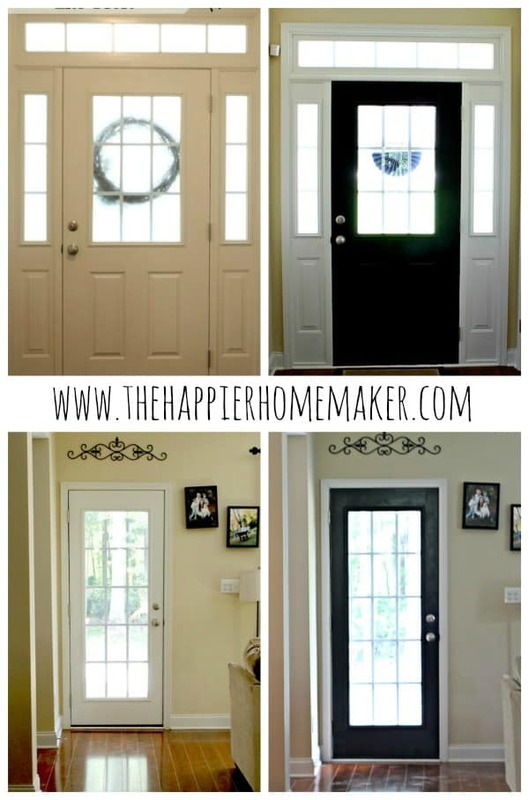 Have you painted any of your interior doors different colors? next post: New Office Lighting! Did you just paint it while the door was hanging or did you take it off the hinge? Soo want to do this to our dingy back door but have worried about having to leave the door open for so long while it dries. Would love to hear your input. love this! I pinned this a yr ago wen we moved to our first home with our son. Finally i have the time and courage to do this! Wish me luck!! Cant wait! Good luck Mayra! We just moved to a rental and I wish I could do it in this house-I loved the way it looked in our last house! 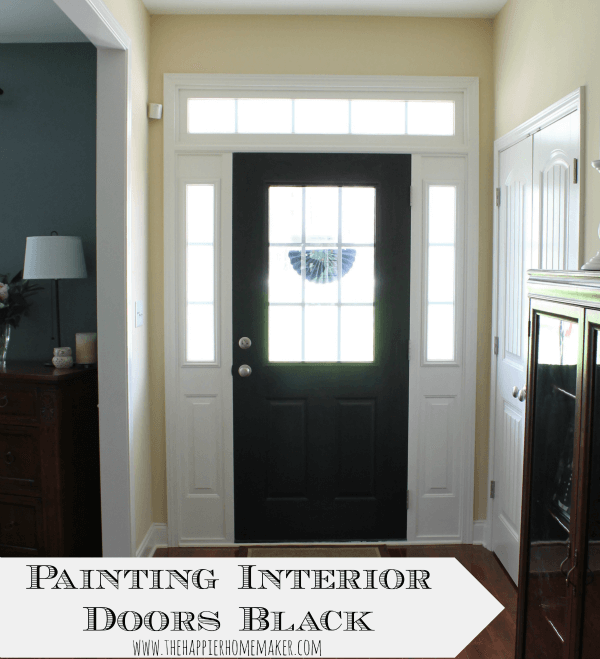 I do love doors that are painted black and yours look fantastic! I am responding to your comment about keeping the picture frames straight. I imagine that they move every time the door is shut. I have taken small straight pins and hammered them into the wall as close to the picture frame as possible. The pins keep the frame from moving and are mostly invisible. You could paint the pins the colour of the wall to completely camouflage but I have never bothered. Let me know if you decide to try this. Looks great!! I’m definitely going to paint my doors black after I add paneling to each one for some updating. Yours look awesome!